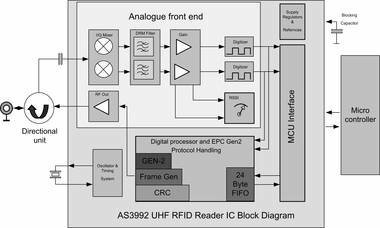 The AS3992 UHF Gen 2 Reader chip is AMS's 2nd Generation integrated analog frontend with protocol handling for ISO18000-6b/c 900MHz RFID reader systems with DRM. Equipped with multiple built-in programming options, the device is suitable for a wide range of UHF RFID applications and is pin to pin compatible with the previous AS3990/91 IC's. It offers improved receive sensitivity to -86dB, fully programmable Rx DRM filters on chip and pre-distortion making it fully scalable and suitable for longer range and higher power applications.